Car Magazine is reporting in an interview with Francois Bancon, head of advanced planning for Infiniti in Japan, that Infiniti is considering a GT-R based car. 'It's too good a platform to use only on one model,' said Francois Bancon, head of advanced planning for Infiniti in Tokyo. 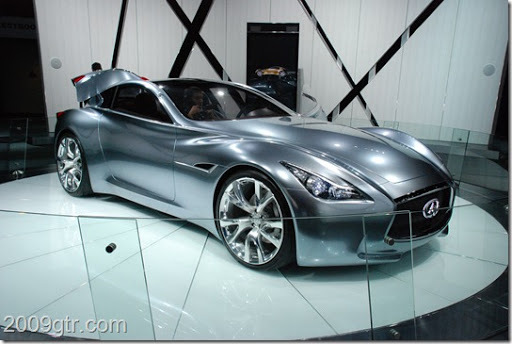 Infiniti has already shown the Essence concept car, which is build on a Nissan GT-R chassis. There are some challenges to making a GT-R based Infiniti. Infiniti is a more luxurious, upscale brand so an Infinti based GT-R would also have to fit in line with those requirements. Nissan sells the Egoist version of the Nissan GT-R in Japan. The Egoist has some special interior appointments that put it above and beyond the normal GT-R. The biggest noise/refinement complaints you hear from owners about GT-R's are the brakes, and transmission noises. The GT-R doesn't have a lot of sound deadening, and the brakes are going for performance over minor issues of noise and dust. The twin shaft GR6 transmission can sound a bit like a box of rocks, but it is something Nissan has been refining from the CBA to the DBA. These kind of items would need to be addressed before Infinti can offer, what might be a $150k-$175k Infinti GT-R. They say that a halo Infiniti wouldn't see production for about five years. The R35 chassis has been produced in Japan since December 2007. The Nissan GT-R is selling as a 2013 model in the US, even if it might be a 2017 model, its still about 10 years on the same platform. It raises the question of exactly how long Nissan might use this same platform with minor versus major changes. Chevrolet, and Porsche are both stepping up and renewing their platforms. If Nissan wants to be able to compete against those cars, eventually they are going to need to make some major versus minor changes. See a video of the Essence on the stand at the LA Auto after the break.